Manager Neil Lennon aims to strengthen his squad in January so Celtic can hit the ground running in next season's Champions League qualifiers. However, he refused to say if James Vaughan was among his targets. Huddersfield boss Mark Robins said the former Everton striker is not for sale after Lennon watched his team play twice in four days. 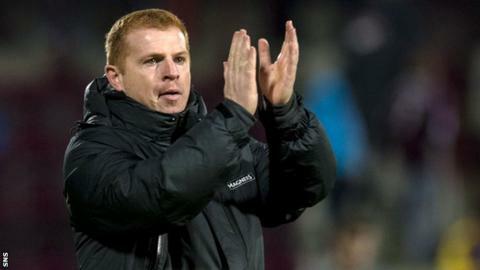 "I've been watching a lot of players," said Lennon. "Maybe I wasn't specifically looking at James Vaughan." Lennon was at Huddersfield's 2-1 victory over Burnley on Saturday and returned to see The Terriers win at Bolton on Tuesday. "I'm not here to talk about one specific player," he explained. "There were 22 players at Huddersfield-Burnley and 22 players at Bolton-Huddersfield. "I've been linked with him (Vaughan) and that's fine, people are putting two and two together. "I have spoken to Mark Robins, I know Mark from my playing days. So it's not just James Vaughan I'm looking at but he is a player we think is a good player." Celtic were busy in the summer transfer window but of all the signings only defender Virgil van Dijk established himself as a regular starter. Iceland U21 striker Holmbert Aron Fridjonsson will arrive in January but Lennon hopes to see a few more new faces at the club next month. "The January window is more difficult - clubs don't want to part with players," he said. "But we are looking to bring maybe one or two players in with the view of bedding them in between January and July for obviously, if we win the league, for the qualifiers in July and August. "The close season is so short and with some of the players being away at the World Cup, it will be even shorter this year." Striker Mo Bangura is set to return, with his loan at Elfsborg over and the Swedish club not intending to sign him. "He is still involved in the Europa League and we are planning to give him a bit of time off," said Lennon of the 24-year-old from Sierra Leone. "He has been playing for almost a year. He is due to report back in at the start of next year. "It's up to Mo, we will see what sort of condition he is in and what sort of form he is in. "In the early part of his loan spell at Elfsborg he was doing very, very well so we will see if the loan has given him that match experience that he needed."